郭乐倩, 赵豆豆, 刘蓉, 王红丽, 屈鹏飞, 张若, 米白冰, 颜虹, 党少农. Guo Leqian, Zhao Doudou, Liu Rong, Wang Hongli, Qu Pengfei, Zhang Ruo, Mi Baibing, Yan Hong, Dang Shaonong. Guo Leqian, Zhao Doudou, Liu Rong, Wang Hongli, Qu Pengfei, Zhang Ruo, Mi Baibing, Yan Hong, Dang Shaonong. A propensity score-matched study on relationship between maternal respiratory infection in early pregnancy and gestational age[J]. 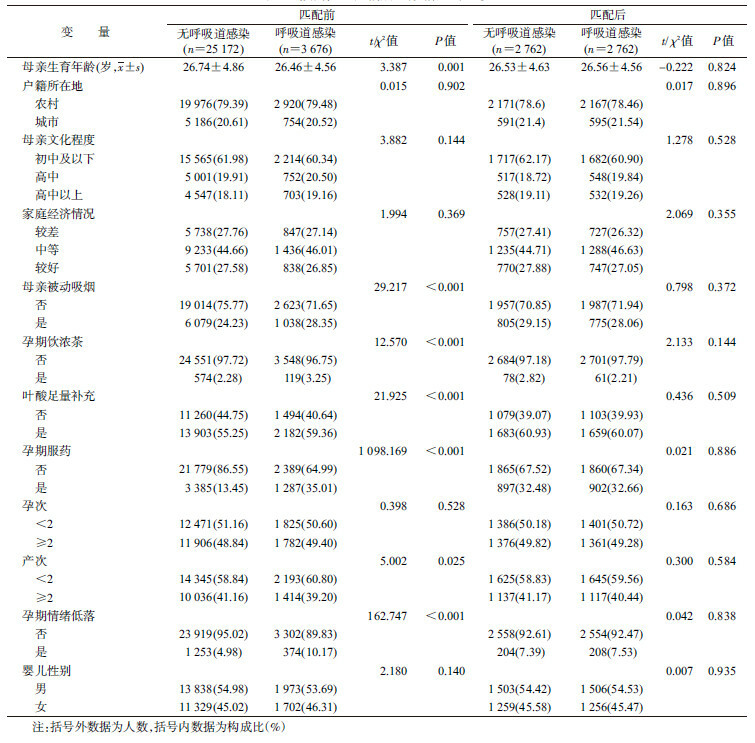 Chinese Journal of Epidemiology, 2018, 39(7): 920-924. Abstract: Objective To explore the association between maternal respiratory infection in early pregnancy and gestational age of single live birth. 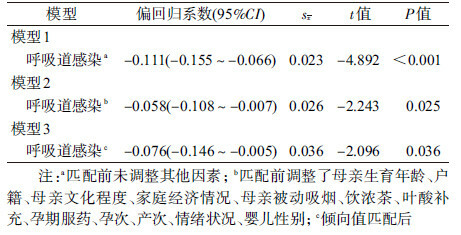 Methods A face to face questionnaire survey was conducted among child bearing aged women in 30 counties (district) of Shaanxi province selected through stratified multistage sampling. Propensity score (PS) matched (1:1) analysis was used to match participants with respiratory infections to those without respiratory infections. A multilevel linear model was used to investigate the association between respiratory infections and gestational age. Through the control of the confounders step by step, three models were established in this study:model 1 for the variable of respiratory infections before PS matching, model 2 was adjusted for variables in model 1 plus some other individual differences of mother and baby, and model 3 for the variable of respiratory infections after PS matching. Results Of 28 848 child bearing aged women surveyed, 3 676 (12.74%) had respiratory infections in early pregnancy. After PS matching, 2 762 pairs were matched. Analysis with model 1 indicated that a decrease of 0.111 week (P < 0.001) in gestational age was associated with a respiratory infection during the first trimester. Analysis with model 2 and model 3 indicated that a decrease of 0.058 week (P=0.025) and a decrease of 0.076 week (P=0.036) were associated with respiratory infection during the first trimester, respectively. Conclusion The respiratory infection during the first trimester was associated with the decrease of the gestational age of newborn. 徐流立, 张琳, 祝参, 等. 孕妇生殖道感染对胎膜早破早产及妊娠结局影响的临床分析[J]. 中华医院感染学杂志, 2017, 27(15): 3555–3558. 徐一鸣, 韩宁, 刘琰, 等. 孕妇生殖道B族链球菌感染对妊娠结局的影响研究[J]. 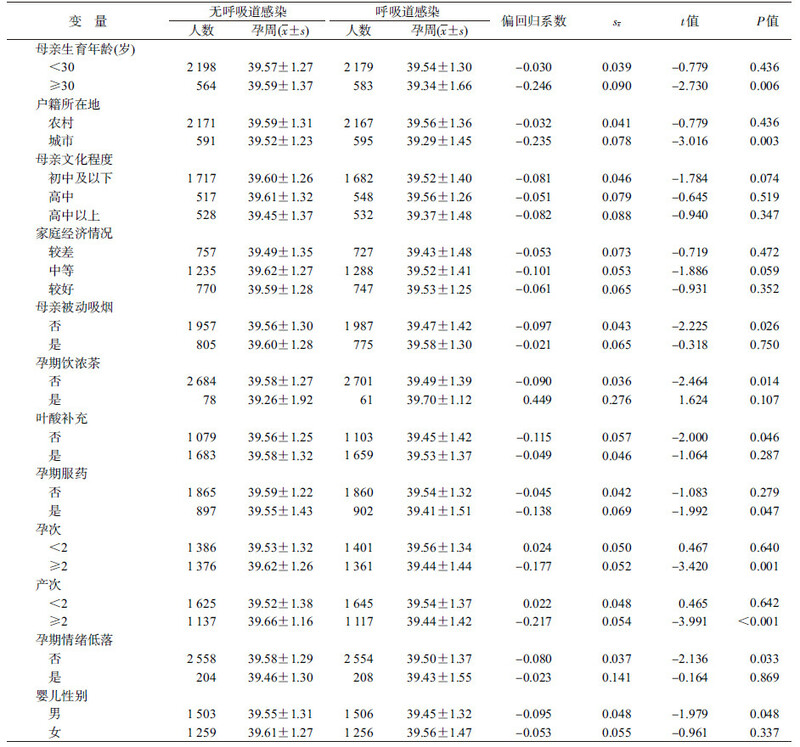 中华医院感染学杂志, 2016, 26(9): 2128–2130. 温迪, 魏武, 周红辉, 等. 妊娠期生殖道感染者不良妊娠结局发生率分析[J]. 中国性科学, 2017(6): 129–131. 庾艳华, 徐建中, 邓佩瑛, 等. 妊娠期糖尿病孕妇早产与足月分娩临床特征差异性分析[J]. 当代医学, 2012, 18(24): 11–12.